Cats don't always like sharing their homes and resources with other cats. You can help cats get along by controlling the introduction process and making sure that both cats have everything they need to feel safe and content. Introduce new cats very slowly. This improves the chances of the cats perceiving each other as being in the same social group, or at least peacefully cohabiting. Forcing cats together too quickly can lead to lifelong conflict and stress that is difficult to resolve. First impressions are very important. You can help cats get along by providing plentiful resources in a variety of places to reduce conflict and competition. 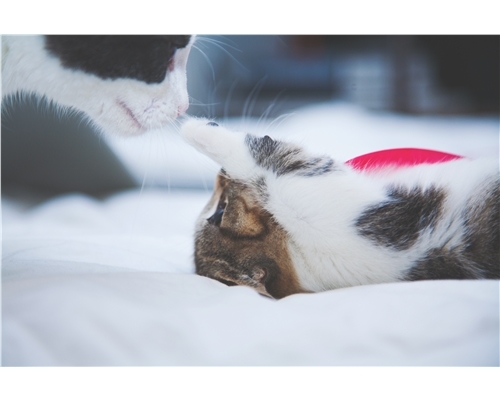 Feline pheromone diffusers, such as Feliway, may help to make the cats feel more relaxed. You can also swap scents using the process outlined below. The first thing to do is to make sure that your existing resident cat can keep their usual food, water and litter tray locations, as well as their usual routines, as much as possible. Give the new cat their own room, if possible. The next step is to allow the cats to see each other, but not touch. You could try using a glass or mesh door between the cats so they can approach or hide as they choose. It can take from a day to many weeks for cats to tolerate each other. Taking things slowly and step-by-step is important. Unfortunately some cats will never get on - as they are solitary creatures, some will never happily live with other cats. The cats are unlikely to fight, but have a blanket ready just in case you need to separate them. Be careful to avoid being scratched or bitten as the cats may be quite excited. Don't chase or shout at them as this will only lead them to associate each other with bad things. As the cats become more comfortable in each other's company, try giving them food to encourage them to come closer. Choose somewhere where they can easily escape. 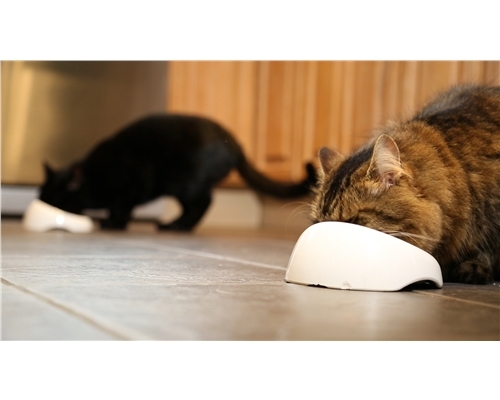 Placing an object, such as a chair, between their feeding bowls may help them feel less threatened. Over time you can move their bowls closer together but do not place them side by side. If your cats are apart for any reason, they may not be recognised as part of the same social group when they return. So if your cat has to stay over at the vets, or visit a cattery, you may need to reintroduce your cat, or give them time to pick up the smells of home when they return. This effect is greater when the cat is away from home for longer, and the reintroduction process may take longer.